Today, I’m writing you from Germany, where we are visiting family and friends. Follow all our fun on Instagram! Check out my favorite cake, my favorite chocolate store, historic buildings, country life, and more. Before we left for Germany, I took pictures of a few fun items I bought at a local estate sale in our neighborhood. The prices were awesome! I only paid about $8 for all of these items. Can you believe it? The potholder still has the price on it! 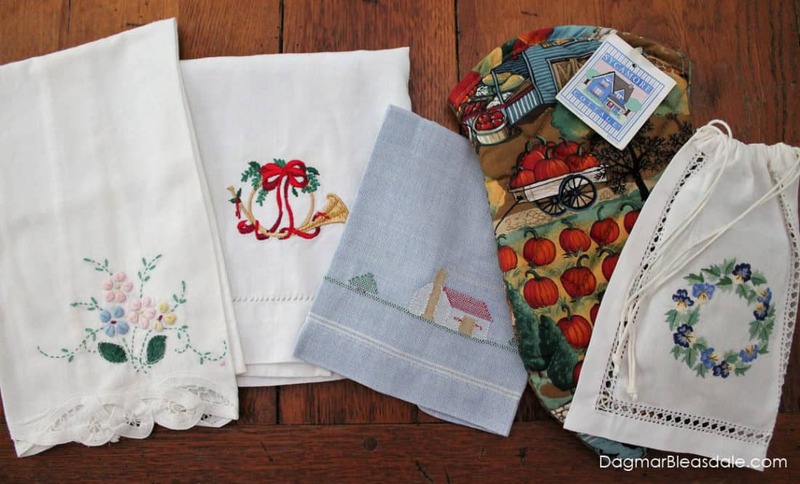 I can never have enough pretty vintage embroidered linens — I use them as hand towels in our powder room. 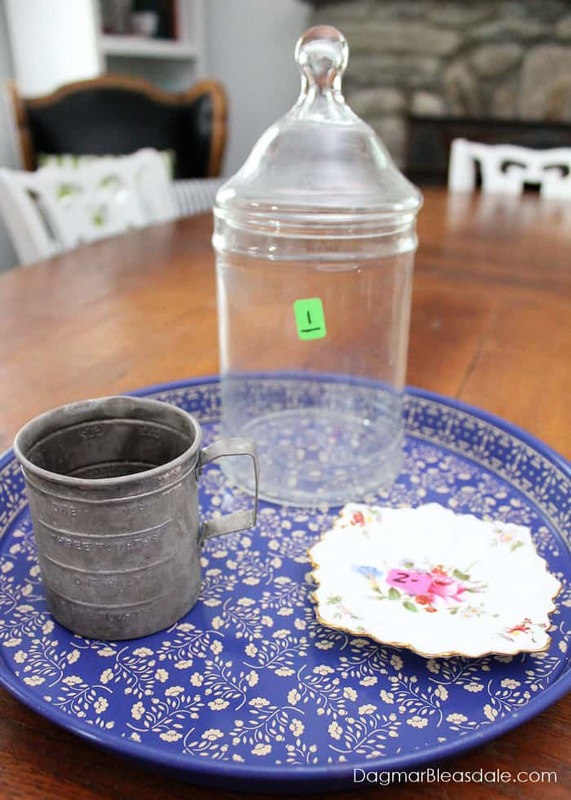 This blue tray is from England, I have a collection of vintage measuring cups, and the glass is perfect to make another DIY apothecary jar like this one I made. 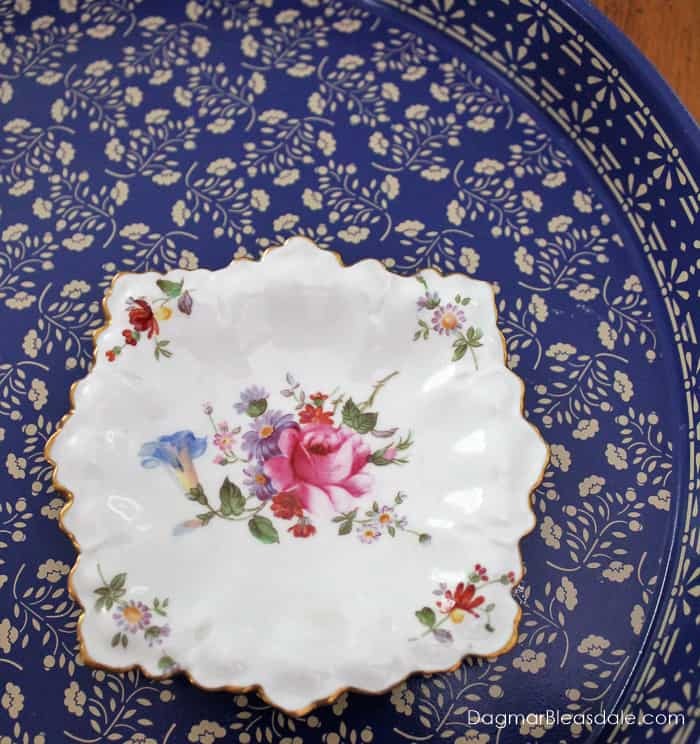 The Royal Crown Derby posies bone china dish makes a nice trinket or soap dish. 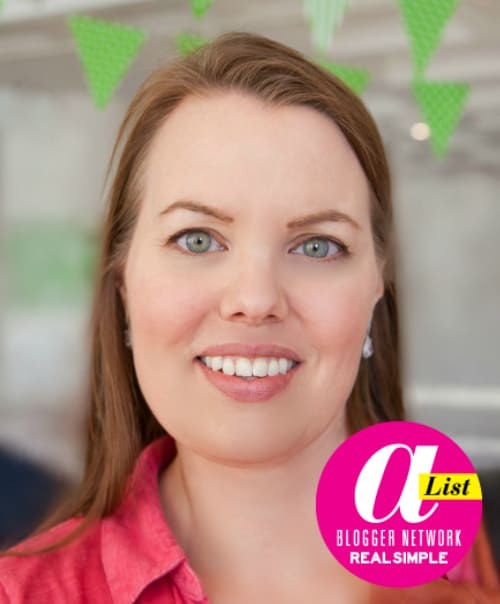 Reading a few blogs this week, I came across this post. 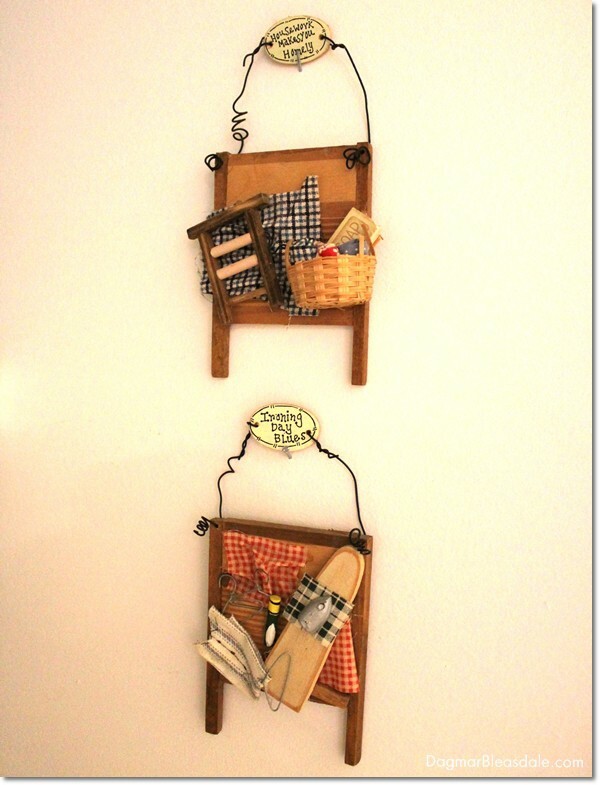 Joy, who blogs A Vintage Green, wrote about making this adorable sign for the laundry room. 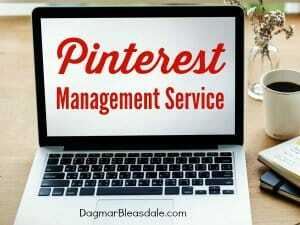 Check it out to see how easy it was! 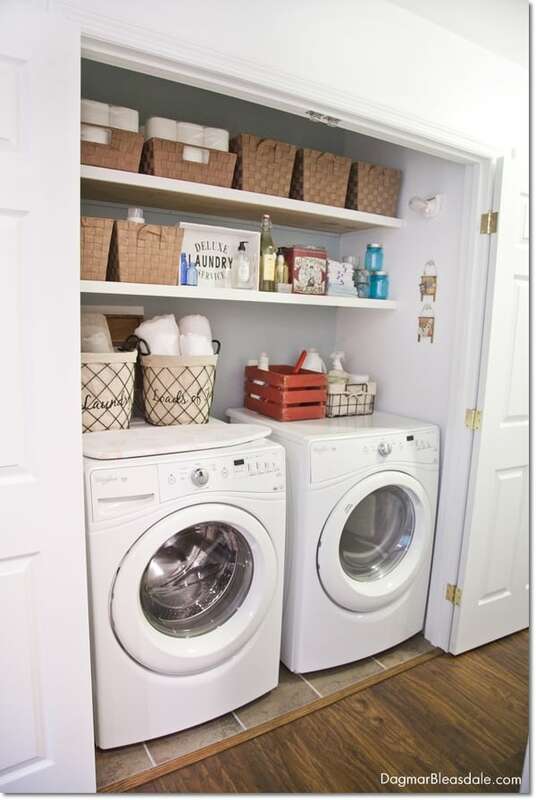 Here is a picture of our laundry “closet” and the little laundry signs I hung up on the wall. They are also a thrifty find. 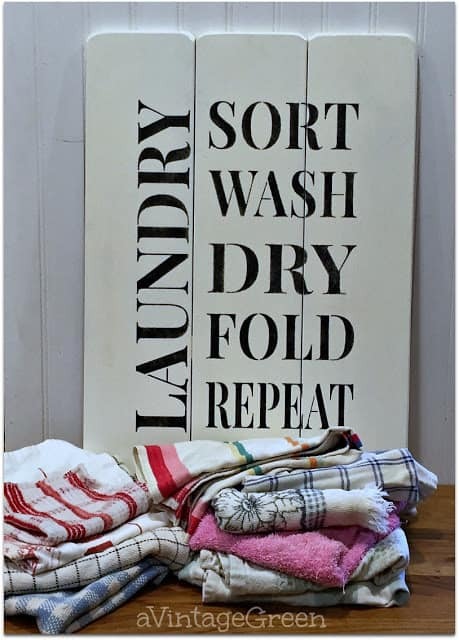 If you don’t feel like making your own laundry room sign, you can find the most adorable laundry room signs on Amazon in all kinds of materials and designs. You’ll find some with a farmhouse flair, with a French flair, with a vintage flair…the choices are endless. The shape of this laundry room sign is my absolute favorite, and the fact that it’s enamel and in this pretty blue. 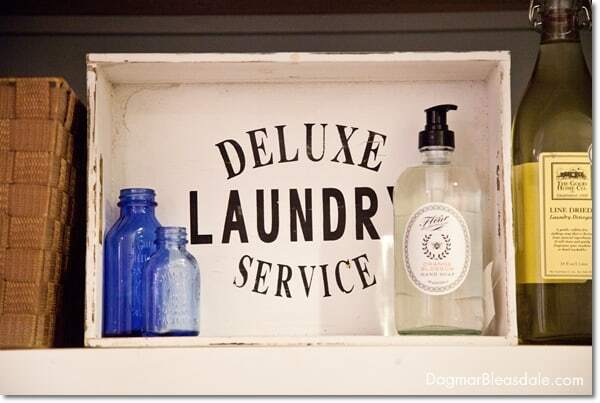 You can personalize this laundry sign – how cool would this be as a gift! Enjoy your visit in Germany, Dagmar! Safe travels.